Based on the work of Fabrice de Villeneuve, this tapestry "Wine and Pears" is a delightful still life to behold. This tapestry depicts a still life of wine and pears on a window sill, and there is an air of quaintness and casual beauty that is an unmistakable trademark of de Villeneuve's pieces. Here the afternoon sun hits the still life and captures a moment in time that as all still lifes do, leaves the rest of the scene and story to the workings of our imagination. The use of color is masterful yet casual and relaxed, as is the subject matter itself. The subtle green of the pears echoes the green of the wine bottle, and the burgundy of the wine compliments the glowing beiges in the rest of the scene to create a cohesive color effect. 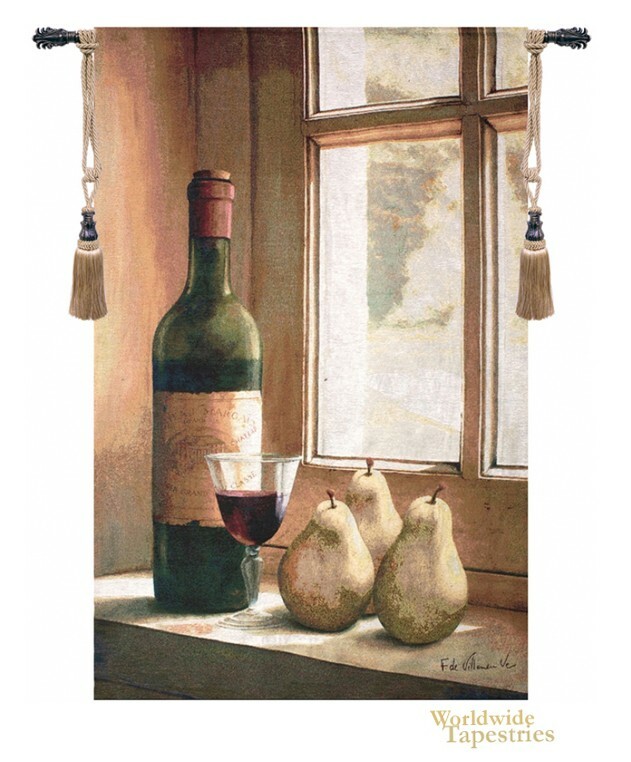 This still life art tapestry "Wine and Pears" is backed with a lining and has a tunnel for easy hanging. Note: tapestry rod and tassels, where pictured, are purchased separately. Dimensions: W 35" x H 53"